These unit studies are a fun, interesting, hands-on way to study our 50 states. 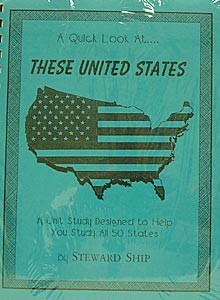 Includes 50 Fact Sheets facing 50 U.S. maps. Research each state, its capital, draw in rivers, mountains, bordering states, then paste on bird and flag stickers and industry symbols (all included). Also includes: writing paper, capitals quiz and more. Color in each state on U.S. map as you complete it and fill out the large U.S. map with state and capital names. Simply study one state per week or do a full-blown unit study and go deeper. Ideas to enhance study are included. Grades 3-4 and up. From Stewardship Publishing.